My last major piece was an ambitious installation entitled Dance of the Melissae, a multi-sensory, multi-media body of work that explored the world of the honey bee society and its relationship to art, science, technology and ancient matriarchal cultures. 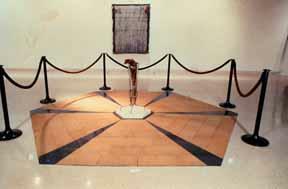 This piece was exhibited at the Brand Library Art Gallery in Glendale, California in 1994. The 3,000 square foot space lent itself well to my ideas for creating a multi-sensory construction of an ancient and sacred site and its interior components. The integration and centralization of bees and bee worship by ancient matriarchal cultures are historical testament to the power and fascination of the astounding world of bees. Borrowing images from nature and bee society, I attempted to reveal the inherent connection between the natural world and technology. The piece incorporated mixed-media wall reliefs, found-object sculptures and computer-generated photographic images installed together and linking traditional media (drawing, painting, printmaking and sculpture) with the more contemporary world of digital media. From a conceptual base that is framed by feminist thought, I am using the "bee" and the "honeycomb" as metaphors to re-interpret scientific ideas. My intention is to suggest that science is based not only on observing nature's structures but also on imagining them. The Large Votives, recall an ancient memory of nature as a goddess. Measuring 7' x 5', they are wood panels wrapped with lead sheeting and employ other mixed media materials that evoke a particular goddess. They included: Demeter, mother of the bees, Techne, goddess of art and science, or craft and technology, and Hymen, who rules over marriages and honeymoons and because bees are hymenoptera (veil-winged); and Aphrodite's Lattice, a floor piece to honor the ritual of meditation established by the Pythagoreans. My basic fascination with the form of the hexagon prevails throughout my work. As a form found in nature, it has a long history that is grounded in geometry and goes back to Pythagorus. Related to ancient goddess worship and found naturally in honeycomb, it belongs to the different worlds of science and nature and acts as a link between them. As Professor Mary Davis MacNaughton, Director of the Ruth Chandler Williamson Gallery at Scripps College, Claremont, California described the installation in her essay for the exhibition brochure, "walking into the space, one is aware of the distinctive fragrance of beeswax permeating the air. In addition to beeswax, fragrance comes from three glass brink vases, which contain aromatic spices of fenugreek, coriander and lavender. All of these spices intermingle to create a subtly intoxicating atmosphere. Also stimulating is the sound of the space, which resonates with a continuous rhythm; on closer listening, one realizes it is produced by a cappella tap dancing. The sound's mesmerizing, repetitive pattern calls to mind humming bees and archaic chants." It was my intention to not only challenge conventional notions of science as it relates to nature and art but to also fully involve the viewer in the sensual pleasures of Dance of the Melissae. Currently, I am working on a video installation entitled Re:Envisioning the Melissae. The video, Telling the Bees, will be displayed at the bottom of a stone well surrounded by sand and enclosed by four large mural-sized (6' x 8') cibachrome prints of digital images. The viewer is meant to experience the journey of one of the bee priestesses as she wends her way back in time looking for the ancient traditions in order to know better how to live her life today. Using the computer to digitize and manipulate the footage, I will be editing video taped in Greece, Romania and Spain where the bee priestess recently traveled in search of the ancient ways. A soundtrack mixing tabla flamenco, bees humming and running water will enhance the immersion of the viewer in the space.